Radium Engineering offers top of the line fuel delivery solutions for the motorsports market, including fuel cells. Many consider fuel cells as a simple metal container, when in fact a proper fuel cell is more complex for safety purposes. A basic aluminum, stainless or mild steel container can easily leak in the event of a collision and could lead to a dangerous fire situation. Even a minor fender bender could create enough force to distort and crack the metal container, resulting in fuel spillage. 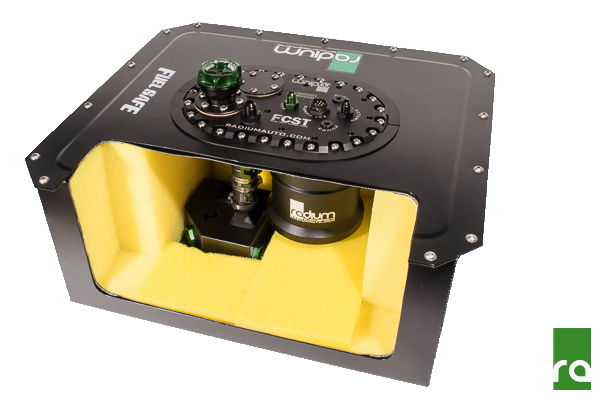 Fuel weighs roughly 10lb per gallon, and with a 12 gallon fuel cell that is 120lb of fuel sloshing around inside the metal box, flexing the walls and straining the welds. When that much weight is subject to g-loading from aggressive driving, the resulting forces are very large and can damage poorly designed metal containers. Also, chemical compatibility, weld quality and corrosion are concerns when using a plain metal container for fuel storage. Fuel cells used in motorsport racing often require FIA certification to ensure safety requirements are met. The guide below helps explain how a fuel cell works and why certification is necessary. As shown, fuel cells are generally comprised of three components: the outer shell (enclosure or can), the bladder (where fuel resides) and foam baffling. Radium Engineering fuel cell enclosures are made from aluminum, but others are generally made from steel. The enclosure is the first part of the cell to absorb damage and to help prevent a serious catastrophe. This layer is similar to the construction of a helmet. The outer enclosure aids in safety but is not the most critical part. FIA does not have a standard thickness for the outer enclosure. Other governing bodies do require certain thicknesses. For instance, SCCA requires a fully enveloped enclosure comprised of 0.036” steel or 0.059” aluminum. The fuel cell bladder protects from fuel spills. The bladder holds fuel and must be resilient against impacts, punctures, and tears. The material also needs to be flexible enough to prevent cracking or fuel leakage in the case of impact. These two requirements have led to the development of high-tech materials. There are a few different materials used for bladders that vary from manufacturer. 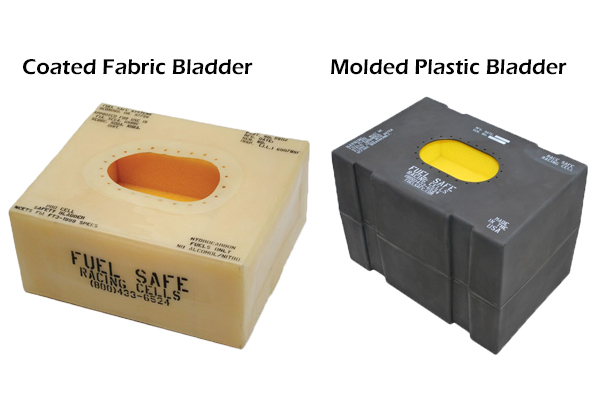 The fabric-based bladders are comprised of aramid fibers coated with special elastomers while the rigid bladders are rotomolded from a fuel resistant plastic. The foam baffling is basically a large sponge inside the fuel cell. If catastrophic failure were to happen, this porous foam helps absorb the fuel and prevent an explosion. As an added benefit, it helps prevent fuel slosh which could adversely affect performance. The Federation Internationale de l’Automobile (FIA) promotes road safety around the world. The prominent role is the licensing and sanctioning of F1, WRC, World Endurance Championship, and various forms of sports car and touring car racing. For the safety of the driver, FIA certification is required in many forms of racing. This certification covers many components including fuel cells. FIA certification has a few distinct classifications: FIA FT3, FT3.5, and FT5. There are other standards required by sanctioning bodies, but FIA is inline with most forms of racing. All of the ratings clearly define the requirements for materials, construction, and testing. The only difference between the ratings is the strength of the bladder material. All tests utilize the same procedures but the levels of certification are based on test results. FT3 is the lowest level requiring the lowest minimums while FT5 requires the highest. FT3: Requires 450 pounds of tensile and puncture strength. FT3.5: Requires 1000 pounds of tensile and puncture strength. FT5: Requires 2000 pounds of tensile and puncture strength. Fuel cell certification expires 5 years after the date of manufacture. There is an option to have fuel cells inspected. They can receive recertification for up to 2 more years. Maximum total lifespan of a fuel cell is 7 years. Check the label on the fuel cell bladder for an expiration date. Many factors contribute to the bladder breaking down overtime. Anything from heat, UV light, vibrations, and the fuel itself will eventually break down the elastomers. Water and alcohol cause deterioration more rapidly. Fuel cells generally require some level of maintenance. Regular maintenance ensures it will last the full 5 years and stand a higher chance of recertification. Maintenance tips: Empty the fuel cell during offseason storage. If fuel with any alcohol content is used, such as E15, the fuel cell should be drained after every event. This will extend the life of the fuel cell. Alcohol is most damaging to the foam. Proper care of this part of the cell is crucial for maintenance. Foam breaks down over time and particles can clog the fuel system. It is ideal to periodically replace the foam in the cell to increase cell longevity. Inspection: While you are replacing the foam, always inspect the bladder. Check for chaffing against the container and apply edge tape as necessary. Check to make sure the bladder is not delaminating from the aramid fabric or cracking in the elastomer. Cracks commonly form in the folds and around molded areas. Cracks cannot be repaired without being taken to a proper facility. Cracked bladders must be replaced. It is always a good idea to inspect at the end of the season instead of the weekend before the new season starts. Top Tip: Effective January 2013, all certified cells include a hologram with FIA labeling. Because the FIA certification is not replaceable, bring it to the event. If the form is lost, it cannot be replaced. 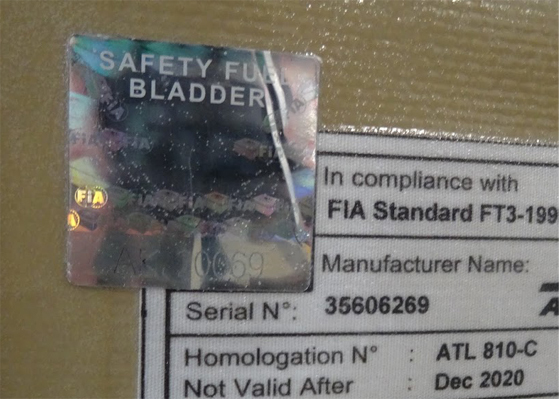 Worst case scenario, the cell can be dismantled to show the FIA hologram on the bladder. However, this will unlikely be accepted through tech. While metal box style "fuel cells" are prevelant on the discount market, they offer little to no engineering or regard to safety. The added cost of a bladder-style fuel cell can be easily justified in the event of an incident.